The hearing and chaos in Washington DC. 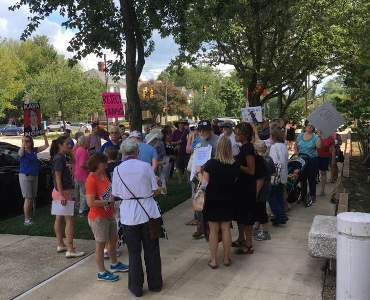 North Carolina had protests in Raleigh, Charlotte, Winston-Salem, High Point on 9/4/18, with more planned. People protested in other ways (besides shouting at the hearing and possibly getting arrested). In Raleigh, a very large group rallied with speakers representing women’s organizations, worker’s organizations, and LGBTQ organizations. Asheville did a “Die-In” on 9/5/18! The Winston-Salem people went to Senator Richard Burr’s office. Brett Kavanaugh would be a devastating Supreme Court justice – he values corporations over people, and his religion over tolerance. He’s spoken out for “favoring fetal life” and fought against the Affordable Care Act. Speakers in Raleigh represented many organizations covering women, LBGTQ people, workers, and the environment. There was one set of speakers. The group took their signs and walked around to the side of the building outside of Senator Thom Tillis’ office, chanting all the while. When they returned, another set of speakers took their turns. Dewey Botts opens the gathering with a statement of what’s at stake and asked for a moment of silence to think how much harm Kavanaugh will bring to this country. 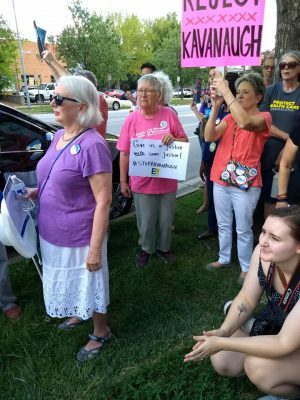 The “Raging Grannies” had a new song all about Brett Kavanaugh. Tara Romano sets the table for why Kavanaugh is not working for the American public on a number of reasons. We believe the court is for the people! Ames Simmons from Equality NC explains the consequences for the LGBTQ community if Kavanaugh is confirmed. Biggest concern Trump giving an out for medical providers to refuse to provide medical care for the LGBTQ community. Mary Jose Espinoza from El Pueblo talks about immigrants, impact on rights of undocumented workers. Felicia Burnett of NC Mom’s Rising lets the Tillis crowd know what Kavanaugh means to families. He’s not only hostile to reproductive health care and choice, he is hostile to gun safety, he is hostile to workers’ rights. Presidential power would go unchecked. 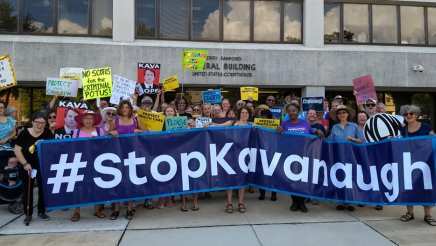 Jillian Riley of the Sierra Club talks Kavanaugh and the environment. Dani Hoffpauir of Planned Parenthood tells the crowd that Kavanaugh has a history of arguing against access to abortion, birth control and health care. And it was Kavanaugh last year who tried to prevent the 17 year old immigrant in a detention center from getting an abortion, even though she got permission from another judge. Mars Earle of Carolina Abortion Fund, which helps women in both North and South Carolina, shares some of the women’s stories. Gloria De Los Santos of Action NC wakes up the Tillis’ staffers with her fiery rendition of what Kavanaugh will do to social and economic equality which is already in peril. Gailya Paliga, NC NOW President, talks about the advice and consent responsibility that both US Senators Thom Tillis and Richard Burr have, and how they should do their jobs. Many say the hearing should be delayed until and only if the Trump is cleared from the many crimes for which he is being investigated. Others say this rushed and forced hearing would forever stain Kavanaugh. “This is the most incomplete, most partisan, least transparent vetting for any Supreme Court nominee I have ever seen,” said Senator Patrick Leahy (D-VT). Leahy was elected in 1974! We are doing another rally highlighting issues with Kavanaugh in Raleigh on 9/11/18 with new speakers. So many people would be hurt by this extremist judge. Hope to see you at the next Tuesdays With Tillis rally. This entry was posted in abortion, ACA, birth control, do your job, health care, lgbt, Obamacare, reproductive rights, Supreme Court and tagged ACA, birth control, do your job, health care, Obamacare, reproductive rights, Supreme Court. Bookmark the permalink.